Gift from WordPress.com – Where is Naoko? 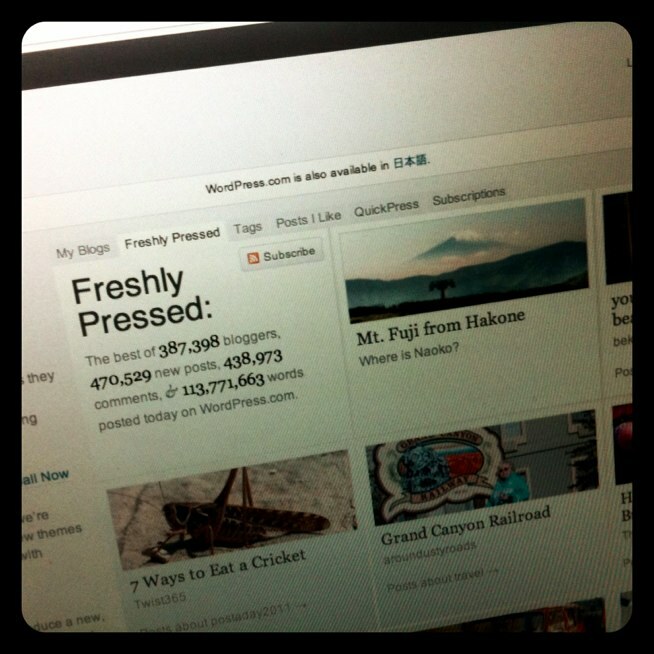 It was a pleasant surprise to receive a comment email notification saying “Congratulations on being Freshly Pressed!” To those who are not familiar with the term, it means to be listed on WordPress.com home page (the photo is a screenshot from yesterday). This felt like the best (belated) birthday gift from WordPress.com for me. People from all over the world found a very personal and tiny snapshot of my life and shared their thoughts – it made me remember the excitement when I started blogging (I have a separate blog in Japanese) in 2003 and got the first comment. I’m not saying that it’s not fun to write unless thousands of people are looking at your blog post. I just think it’s refreshing to be reminded that there are so many people out there who may stumble upon your blog someday and think what you post is pretty cool. By the way, tomorrow (May 27th) is the eighth birthday of WordPress, the open source software behind WordPress.com. Have a beer, cake, or whatever is appropriate where you live, to cerebrate this free and open platform that is enabling millions of people to share their thoughts with the world. Cool post re: WordPress birthday. I started my first blog yesterday (5/25) as a way to express what my skills to a conservative industry I am trying to get a job in. I actually saw your Mt. Fuji photo on FreshlyPressed yesterday, and again just now. Yours is the only blog I clicked through to. Stunning photography. Am blessed to ‘stumble’ upon your creativity – love how the Creative Force trips us through our journey. Thank you for sharing. Wow, that’s cool! I hope your blogging experience will be a great one.